Cone sand Tetrahedron Eve, was one of the first Computer Aided Paintings that I painted, using a sketch that I did on my Apple ][e computer. I used a very low power opaque projector to transfer it to the canvas, so much of the painting was painted in the dark. It was included in the book, Digital Visions, and was shown in a number of museums as an example of "Computer Art", including the IBM Gallery in NYC. Caption reprinted from the book by Cynthia Goodman, Digital Visions, 1987, Harry N. Abrams, Inc., Publishers, NYC; Everson Museum of Art, Syracuse, NY. This Painting is from a series of paintings based on computer-generated imagery. To recreate the image on the computer screen, Davis used an opaque viewer that could project the compositions onto canvas, then he painted them. 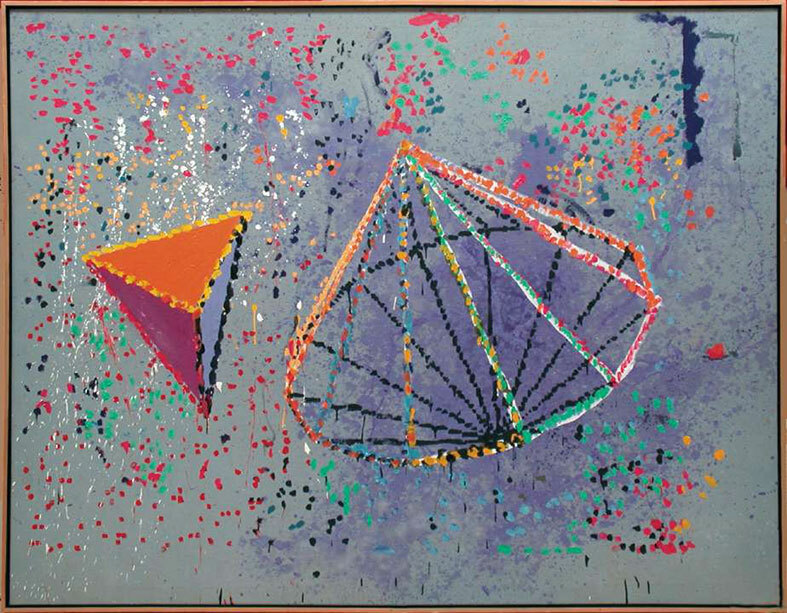 As early as 1968, when he submitted a proposal to the [Los Angeles County Museum's] Art and Technology project, Davis was interested in using computers to help him design geometric [3-D] configerations for his paintings. Hardware: Apple ][e computer with 64 K of Ram Memory. Software: Graforth.